Epic Meal Time is the gift that keeps on giving. And what it keeps giving are YouTube videos of gargantuan culinary monstrosities that no one asked for... but everyone wants to gawk at. For example, this cake-sized Oreo, or the world's unhealthiest salad. The latest installment? 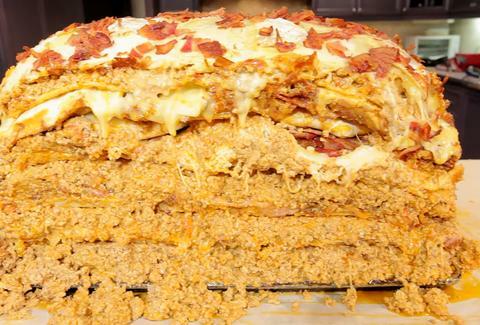 A bacon lasagna roughly as big as a golden retriever, clocking in at an unheard of 1 MILLION CALORIES. For reference, that would be 1,776 Big Macs. Well, regular Big Macs. I feel like in this context it's important to specify. Let's look at the numbers here. They included an artery-clogging 120 packs of bacon -- accounting for more than 308k calories on their own. And if that didn't stop your heart in its tracks, they soaked said bacon in 13.7k grams of rich, succulent duck fat. Eating the recommended average of 2,700 calories a day, this sucker would last 370 days, which is MORE THAN AN ENTIRE YEAR. So yeah, my plans for 2017 are pretty much set. See you on the other side. Please bring Tums.